Remove the balance shaft bearing carrier bolts. 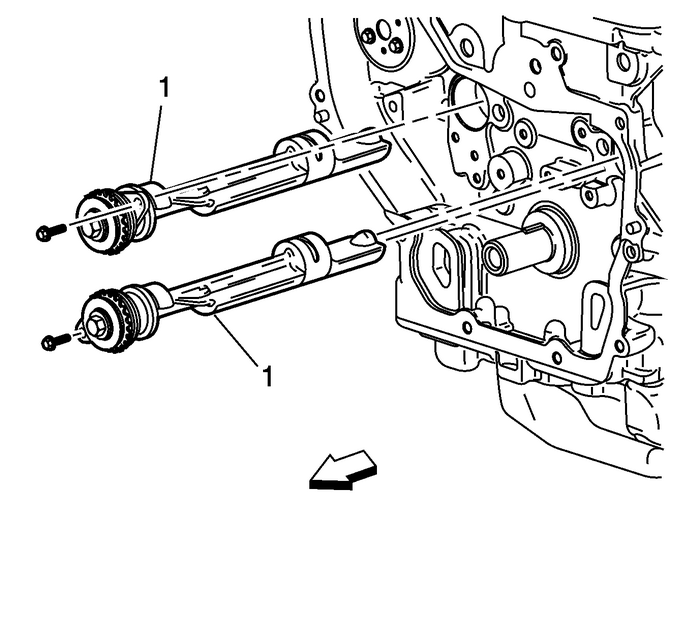 It is possible to install the intake side balance shaft into the exhaust side andvice versa. 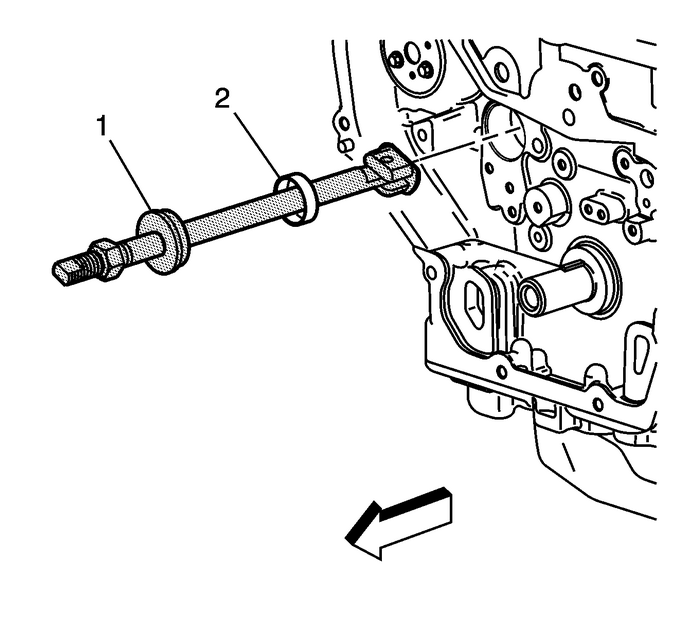 Please use care not to install the balance shafts into the wrong bores.Engine vibration will result.Do not remove the bolt holding the sprocket.Remove the balance shaft assemblies-(1). Caution:Proper centering of the tool is required on the balance shaftbushing. If the tool is not properly centered then damage to thebearing bore and block will occur. Install the EN-43650 remover-(1) into the balance shaft hole. Insert the tool with the foot parallel to the shaft. When the EN-43650 remover-(1) is inserted in the block turn the EN-43650 removerso that the foot becomes perpendicular to the shaft.Center the foot of the EN-43650 removeron the balance shaft bushing.Once the EN-43650 removeris centered on the balance shaft bushing, then insert the centering guide into thefront balance shaft bore and tighten the nut with an appropriate wrench-(2). When the EN-43650 removeris properly installed, before removing the bushing, the end of the toolshould be 116-mm (4.6-in) (a) from the block face. If the EN-43650 removeris less than approximately 114-mm (4.5-in) (a), recheck the tool alignment. 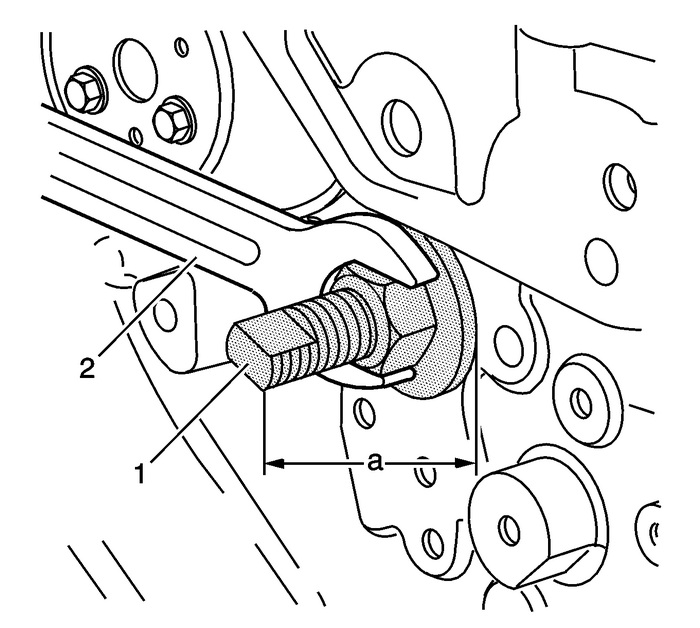 Tighten the nut on the EN-43650 remover-(1) until the tension releases. When the tension releases, remove the EN-43650 removerand the balance shaft bushing-(2).